Last week at Cranbourne, our apprentice Dylan Caboche rode in his first official barrier trials. 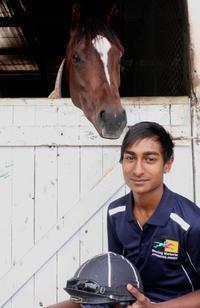 Partnering Special Girls, Owesmebigtime and Hei Matau, Dylan is one step closer to official race riding. Despite his mounts finishing 8th, 11th and 9th in their respective trials, Dylan was pleased with his rides which were all ridden perfectly to instruction. “We’re just trying to get their fitness up before they get a race start. They’re not there to win,” he said. The step up to riding in official trials is a big one for apprentice jockeys but one which didn’t faze the 19-year-old. Although they were only barrier trials, Dylan treated them in the same way he plans to approach his race riding. “I looked at the form and knew which horses were in form and which ones would be the likely leaders. “I’d spoken to a few other jockeys who helped me get prepared for the different style of racing. “Jumpouts are more spaced out and everyone keeps their line. Barrier trials are different because they race a lot closer. As per the rules of his apprenticeship with Racing Victoria, Dylan qualified as an official barrier trial rider after riding in 120 local jumpouts. Once Dylan completes 20 official barrier trials, he will commence race riding with a 4kg claim which he is hopeful will be in a couple of months time.